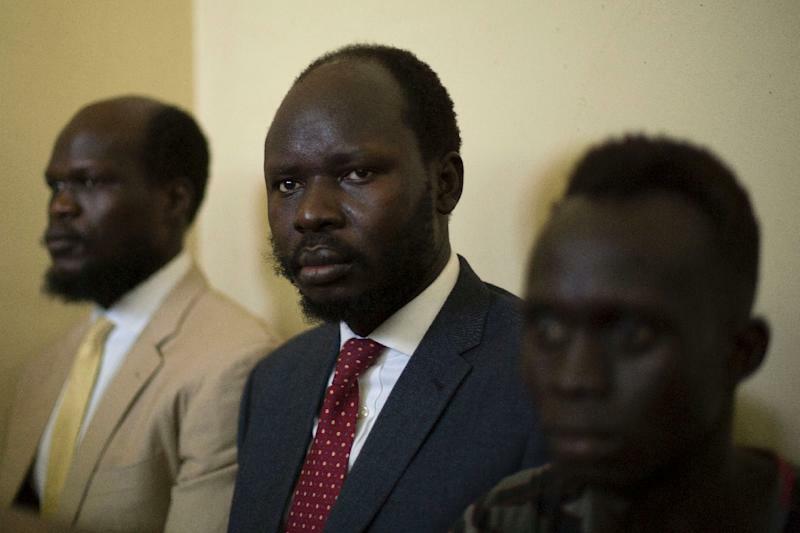 Juba (AFP) - A high court in Juba on Monday charged prominent South Sudanese activist and economist Peter Biar Ajak, 34, with terrorism, after eight months in detention with limited contact with the outside world. Biar was detained in July 2018 after comments he made criticising the failure of the new country's leadership on all sides to stop five years of civil war in which nearly 400,000 people are thought to have died. Prosecutor Deng Acuil charged Biar and six fellow accused, including businessman and philanthropist Kerbino Agok Wol, who has been jailed since April 2018, with sabotage against the state, banditry, possession of firearms and public disorder. The charges relate to an October riot in the National Security Service headquarters -- a much feared detention centre known as "Blue House" -- in which detainees reportedly briefly overpowered guards before surrendering. The accused all pleaded not guilty. None of the accused has yet to face charges linked to their original arrests. "This is a confusing part of it because these persons were first arrested on different reasons which are not known to us. They are being brought to court on other reasons which is an event of October," said Biar's lawyer Philip Anyang. He said Biar "is a civilian who has never touched a gun, held a gun or been involved in any rebellion or any thing to do with the army," Anyang told AFP. Wol, a former security officer who became a businessman and runs his own private security firm as well as an NGO to empower youth, told the court he was forced to give a statement while "guns were on my head" during the investigation. Biar is an economist who has worked for the World Bank, studied in the US in Philadelphia and at Harvard, and is studying for his doctorate in Britain's University of Cambridge. His arrest prompted condemnation from the United States. South Sudan descended into war in 2013 when President Salva Kiir accused his former deputy and fellow former rebel leader Riek Machar of plotting a coup. The pair had risen to power during Sudan's 1983-2005 civil war between north and south, before South Sudan won independence in 2011. Machar was reinstated under a peace deal as vice-president in 2016, but fled the capital months later chased by Kiir's tanks and helicopter gunships. He is due to return to Juba in May as vice president under a reincarnation of the peace deal signed in September 2018. But progress in the latest deal has been slow amid multiple lingering unresolved issues.